Our family received tickets for a carriage ride around the Gaylord Opryland Hotel. 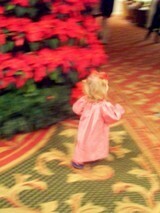 We were so excited to see the Opryland Hotel’s Christmas lights and decorations. But — as we learned the hard way — the Opryland Hotel is no place to take your family Christmas photo! The carriage rides take you around the Opryland Hotel‘s circular driveway, up and down the alley of white-lighted trees. The carriages are pulled by Tennessee Walking Horses. They are so huge! After our short ride, we went inside and journeyed from one end of the hotel to the other. We had to! In order to save the $16 SELF PAY parking fee, we had parked at the Opry Mills mall and walked over to the Opryland Hotel. Touring the lights — inside and out — is FREE. Our walk inside the Opryland Hotel started the Magnolia Portico (what used to be the main hotel lobby), with its grand staircase and immense poinsettia tree. Down the hallway, we detoured through a life-size nativity. 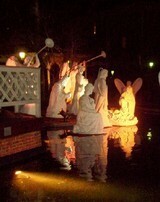 Opryland’s Walk Through Bethlehem takes you outdoors in a small loop around a pool of water. Then we wound through Opryland’s conservatories. Both the Cascades and the Delta Island offer lush greenery, fountains, and ropes of lights hanging from the glass ceiling. Taking a good photo in the semi-darkness there is nearly impossible — at least at night. During the day, the inside of the Opryland Hotel is filled with natural light, which is much better for taking Christmas photos. Here are 3 things you absolutely must see during your next visit to the Opryland Hotel. At night, your best bet for photos will probably be either of the hotel lobby areas. 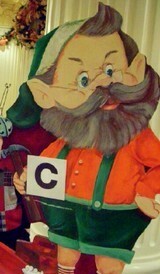 The newly renovated Cascades Lobby — where the concierge desk is located — has impressive columns and fun figures like this elf. The Cascades Lobby is where you go to buy tickets to Opryland Hotel events like the Radio City Christmas Spectacular, the Pam Tillis Dinner Show, Grinch On Ice, and other seasonal shows. Again, even the white-marbled Cascade Lobby at night is lit with pockets of dim or harsh lighting. That didn’t stop us from trying, though! 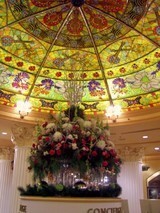 After all our walking, I think my favorite photos were taken in the main Magnolia Lobby. The deep reds of the poinsettia tree, the grand staircase and even the richly patterned carpet make the best backdrop — provided you aren’t taking photos of a toddler! By the way, if you’re never been, Opryland’s Christmas lighting ceremony is rather Disney-like.